This page serves as a listing and access point for digitization standards I maintain and review for digital curation work at Rutgers University Libraries. The standards documents listed here are mirrored from the official digital standards listing on the Rutgers University Community Repository (RUcore) website. As these documents are reviewed and revised to adapt to changing trends and technologies, they will be updated and made available at both locations. All of the standards listed here are followed as standard procedure for all RUcore (Rutgers Community Repository) affiliated preservation projects. It’s important to note that these standards are recommended minimums. In other words, if you are preparing for a project and wish to follow our preservation standards, your project planning should take these recommendations into account. But this doesn’t mean that we will automatically reject digital objects outright for preservation purposes if they don’t meet the standards. 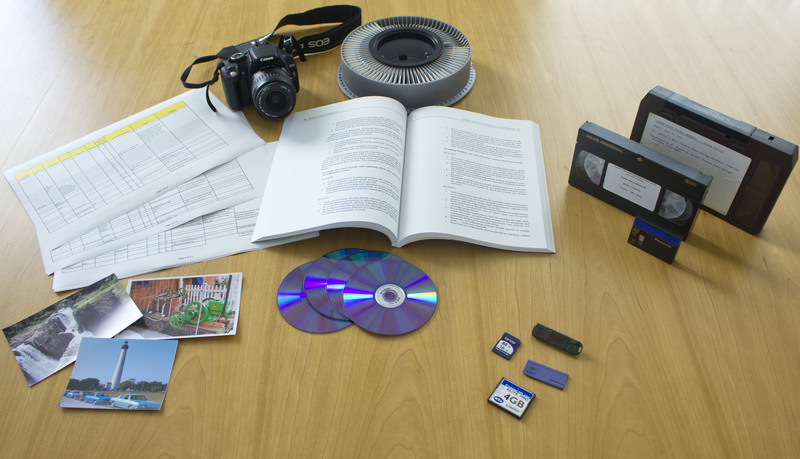 For example: in cases where the digital copies are the best objects available, the objects are of high value, and the means to obtain a better digital copy don’t exist, it’s very likely that some requirements may be waived and “best-effort” preservation attempts will be applied. However, we cannot assure the longevity of such objects. The files listed below are in Portable Document Format / Archival (PDF/A), and requires the appropriate software to read this content. Open source readers for Linux, Mac and Windows are available. All iOS and most Android mobile devices, as well as Mac desktops can view these files natively. For Microsoft Windows desktop systems, the Adobe Reader can be obtained here. Born Digital Still Images (Digital Photographs). These standards relate specifically to photographs taken with digital cameras. Includes a rationale for why these standards exist. To go straight to the requirements, jump to page 5. 201KB PDF File. Last Updated: August 3, 2010. Please note: Updated standards for video are under consideration at this time. Please refer to this draft, which will likely supersede the current posted standard for moving images shortly. Includes a PDF document with best practices, based on NARA guidelines from 2004, with updates and enhancements. Required reading for any agency or project participating in the Federal Agencies Digitization Guidelines Initiative (FADGI). The LoC has released a guide that is intended to both instruct their internal staff on preservation arctics, as well as provide a reference point for the preservation community. The above link lists their specifications for various analog and digital formats. Also, additional background information can be found here. Are easily migrate-able to newer formats, should a new preservation format become more widely adopted, or the old format show clear signs of obsolescence and declining support. Standards development is a continual process, where new technological trends and improved formats are continually being proposed and developed. The recommendations posted here are periodically reviewed (at least once per year) and updates made as appropriate. Major changes to these recommendations are carefully evaluated and scheduled for adoption by RUcore upon discussion and ratification by the development and administrative committees governing RUcore’s project path. This blog is extremely helpful, Isaiah. I wish it were more highlighted in RUL. Anyway, I need to do more in NJDH to bring out the articles, e.g. on Standards. That stuff is all in static html, so a chore for someone, but it has to be done!